Anthony who? 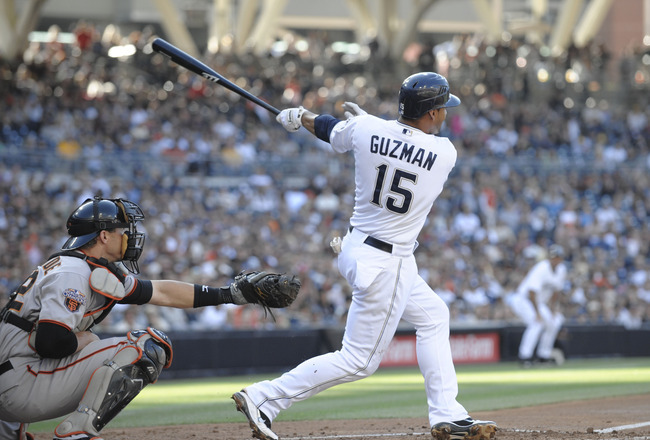 Since July 14 (21 games) Guzman has hit .391/13/4/22/3 while mostly batting out of the cleanup spot. He also loves calling Petco home, in 42 at bats he is putting up an absurd line of .452/11/4/15/3. In ESPN he is somehow eligible at shortstop so this is an absolute no-brainer. For Yahoo, I would consider a swap for Adam Dunn, Aubrey Huff, Justin Smoak and James Loney. With the addition of Hunter Pence, the Phillies are a much better offensive club. Ibanez is now batting sixth where he belongs and the lefties are now split up. Ibanez is the perfect player to bring off the bench for a spot start at home (.288 AVG / 12 HR) and he crushed in July (.284/14/7/25/0). In only 144 AB, Bourgeois has put up 22 stolen bases which is pretty impressive. If you extrapolate his 22 stolen bases over 600 AB, you step into Rickey Henderson territory with 91 stolen bases! You shouldn’t expect that kind of pace all year, but the man has some wheels. If you are in need of speed, Bourgeois is the answer to your problems. Since 2005, Betancourt has been the worst hitter in the game according toFangraphs’ wOBA (min. 3450 PA). Needless to say, I needed to see some production out of Betancourt for him to make this list. He can no longer be ignored. His average has gotten progressively better since the month of June (.284 – June, .299 – July, .409 – August). I’m not saying he will hit .409 the rest of the way but August has always been his best month. In 588 career Aug. at bats he’s hitting .287/71/17/73/4. I’ll take that kind of production from my SS all day and he’s been hitting sixth for the Brewers, not eighth. Ankiel has had a few power surges throughout his career and it looks like he is having one now. In only six games in August he has hit .357/7/4/9/0. Ankiel is a good add for a team in need of some short-term power. He has been hitting leadoff for the Nationals so while the streak lasts, he should be a sneaky source of runs too. *All stats are current as of August 7, 12:00 pm. For other entries in our waiver-wire gems series, click here!